There are only two trails in all of Great Smoky Mountains National Park where you can ride your bike or walk your dog. The Oconaluftee River Trail near Cherokee, NC is one of them. 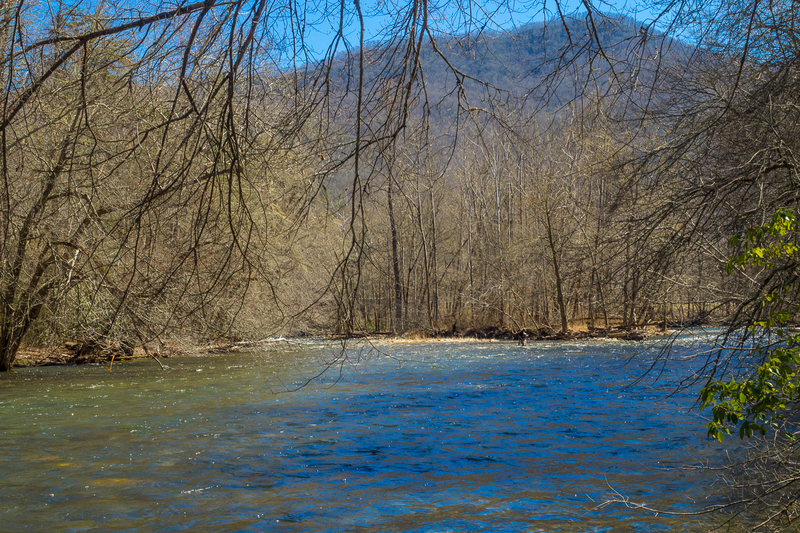 Starting at the Oconaluftee Visitor Center, this easy 3-mile round trip is a stroll along the river, and through history. You pass by the Mountain Farm Museum, a collection of 19th century wooden structures that were restored here from locations all over the national park. You’re likely to see anglers in the river, maybe even elk in the meadows as you walk among giant tulip poplars and tall oak. Chances are you never even thought of this trail when you entered the Smokies from Cherokee. It’s a nice little place to take the whole family for a walk, and an education. I enjoyed the river trail on Saturday, March 7, 2015 from 1:00PM and 2:05PM. My plan was to get a nice exercise walk from end-to-end along the river, then stroll through history in the Mountain Farm Museum. Hike Rating: Easy. Flat. Watch for joggers and dog walkers. Trail Condition: Excellent. Well used and smooth dirt surface. Starting Point: Trailhead behind the Oconaluftee Visitor Center. Trail Traffic: I encountered probably two dozen others in an hour. How to Get There: From Cherokee, NC enter Great Smoky Mountains National Park on Hwy 441. Pass the interchange with the south terminus of the Blue Ridge Parkway and go another quarter mile to the Oconaluftee Visitor Center. The trailhead is in the back of the center. I went to the Oconaluftee Visitor Center in the national park for my phenology training. Since retiring, I’ve been looking for more volunteer work to add to what I’ve been doing with the Blue Ridge Parkway the past five years, and this phenology project appeared interesting to me. The training was finished just past noon, the day was still young, the weather was gorgeous, and since I drove all that way I might as well find a hike. Conveniently, the Oconaluftee River Trail is right there at the Visitor Center. This 1.5 mile, one way, trail follows the Oconaluftee River from behind the Visitor Center to the edge of the Qualla Boundary, the tribal lands of the eastern Cherokee. It also happens to be the park entrance boundary. Periodically along the trail you will encounter exhibits that present Cherokee artwork, traditions and quotations about the Cherokee’s spiritual relationship with this place. The Cherokee have long honored the mountains of the Smokies as places to seek visions and receive directions from their Creator. For example, one of the exhibits tells the story of evergreen vs. deciduous trees. Evergreens keep their leaves and remain green all year, whereas the deciduous trees lose their leaves in Autumn. The Great Spirit made all the trees and plants and asked them all to stay awake and fast for seven nights in reverence, and the first night they all did. But by the second night some fell asleep, with even more doing so on the third night, and so on. By the seventh night only a few were still awake: the holly, laurel, cedar, hemlock and a few others. The Great Spirit said they would be able to keep their hair, their leaves, all year long, and he gave them special powers as medicine for the Cherokee people. Another feature of the Oconaluftee Visitor Center and River Trail is the Mountain Farm Museum, a collection of historic log buildings gathered from throughout the Smoky Mountains and preserved at this single site. Buildings include a house, barn, applehouse, springhouse, and smokehouse. Most of the structures were built in the late 19th century and were moved to this location in the 1950s. As you begin the trek, it passes right by these structures that are surrounded by a really awesome split rail fence. I chose to wait until the return to pass through the museum. Past this several acre museum the trail enters the forest and you have your first sighting of the river itself. The trees here are quite large, consisting primarily of tulip poplar and oak. They have been allowed to grow for decades, so many of them are coming close to rivaling some of the largest old growth in the Smokies. You will notice that pets and bicycles are allowed on the trail, one of only two trails in the Smokies that do, the other being the Gatlinburg Trail near the Sugarlands Visitor Center. Many people have asked why pets aren’t allowed on trails in the national park. It’s really quite simple: to protect the wildlife, and your pet. Many years ago pets used to be allowed, but there were a number of encounters that resulted in harm, including death, to wildlife and pets. There is even a wild boar breed in the park that carries a sub-rabies virus that is easily transferable to your pet via poopsicles. So while we all would love to bring along our favorite buddy when we hike, it’s really best not to. Save those special occasions for the national forests. The trail follows the riverside for most of the rest of its length. On this sunny and warm day there were a few fly fishermen standing in the river in waders casting their lines to and fro. A Blue Ridge Parkway bridge passes over the river. The shoals at this spot appear to be a favorite place for the anglers. Through the trees beyond the river in the picture above, Rattlesnake Mountain stands over the town of Cherokee. According to tradition, Ogv Unitsi sought a magical crystal from the great poisonous serpent Uktena. Ogv pierced Uktena’s heart with an arrow, retrieved the crystal, and became the most powerful medicine man of his time. The Cherokee had a ceremonial ground on the east side of the river at the village of Nvnvnyi. Late in the winter they would see an orange light glowing from Rattlesnake Mountain. They said that Ogv Unitsi had buried the crystal from Uktena there causing the mountain to light up. This ceremonial ground where the glow can be seen is a special place for the Cherokee. The official trail ends at the park boundary, 1.5 miles from the Visitor Center. There is a stone wall there, and if you walk a few yards out to Hwy 441, you will find the main entrance signboard for the park. The trail itself however, does continue along the river into Cherokee. I would think if you happened to live in north Cherokee, this trail would be a great spot for a daily exercise walk. On my return trip back to the Visitor Center I walked through time as I checked out the individual structures of the Mountain Farm Museum. The Davis House offers a rare chance to view a log house built from chestnut wood before the chestnut blight decimated the American Chestnut in our forests during the 1930s and early 1940s. John Davis spent two years building this house near Deep Creek, NC, completing it in 1900. The log walls are matched; Davis split chestnut logs in half along their length and placed the halves in matching positions along opposite walls. The museum site also demonstrates historic gardening and agricultural practices in season, including livestock. I saw at least four Plymouth Rock chickens running free on the grounds totally oblivious to the people, without a care in the world. As I thought about that, I realized that I didn’t have any worries either, other than getting back home at the end of the day. The sights, the sounds, the gorgeous weather and this realization of serenity are just some of the reasons I love Great Smoky Mountains National Park and will keep coming back as long as I am able.